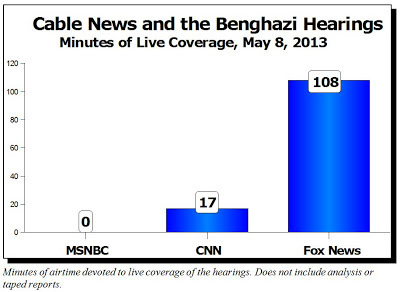 Alan Caruba, Contributing Author: On May 8th as the House committee hearing about the Benghazi attack occurred, you could have tuned through every major network with the notable exception of Fox News and (a) not found any coverage or (b) found so little coverage that you would not even have known it was occurring. Even C-SPAN dropped the ball, devoting that time period to the blathering in the Senate. In a chart put forth by the Media Research Center, the disparity should be an embarrassment to MSNBC and CNN, but it clearly is not. In their view, Americans should not be informed of the way the U.S. ambassador in Libya and three defenders were completely abandoned by the White House, State Department, Department of Defense, and the CIA. One could have sat in the White House situation room and watched the attack as it took place. Such reporting is an insult to journalism, to those who lost their lives, to the men who were attached to the Libyan embassy and spent hours calling the White House and the State Department begging for some intervention, including a Special Forces team in Tripoli who were ultimately told to “stand down” and were “furious” that the very rescue mission they trained for had been thwarted. The witnesses were at times emotional. They were career diplomats and security professionals. They had lost friends and colleagues, and then they had to watch as the President, the Secretary of State, and others in the Obama administration went about spreading a horrid, squalid lie that a “video” was the reason a force of terrorists affiliated with al Qaeda staged the attack on the anniversary of 9/11. High-level staffers removed vital pieces of information tying terrorist organizations to attacks. They knew early on that radical Islamic terrorists participated in the attack. The former Deputy Chief of Mission to Libya, Gregory Hicks, said in the hearing, “none of us should ever again experience what we went through in Tripoli and Benghazi on 9/11/2012.” He went on to say he had personally told former Secretary of State Hillary Rodham Clinton at 2 a.m. the night of the attack that it was a terrorist attack. Gregory Hicks also testified that Secretary Clinton's claiming the attack was incited by a YouTube video caused Libyan officials to hinder the FBI's arrival to the scene. The Atlantic reporter dismissed their testimony saying “we already knew” the facts. That is true, but only for those Americans paying attention. On May 8th, the “real” news of the day was the verdict in the Jodi Arias trial and the coverage of the arrest of the sexual predator who had kidnapped and held three girls prisoner for ten years. These news stories were an unfortunate convergence, obscuring the real story, just as the Atlantic reporter and other liberal news personnel did their best to ignore or disparage it. Anyone paying attention these past years knows that the President lies about everything. His minions in the White House and elsewhere in the federal government repeat his lies. There have been many times when the public has disagreed with the policies of previous presidents, but we now live in an era when Obama and the government he leads has lost all credibility among those who pay attention while the bulk of the print and broadcast media do everything in their capacity to engage in their own cover-up of the facts and, if that doesn’t work, they impugn the integrity of those who seek to expose the truth or report it. We even have a term for those who pay little or no attention. We call them “low information” voters. They are aided in their ignorance by the mainstream media. Can’t happen here? Don’t bet on it. By declaring a national emergency, the federal government has the power to shut down the Internet, arrest and detain anyone without due process, and literally take over every aspect of commerce in the nation. “The coming election,” reported Fassihi, “is the first presidential vote since the contested polls in 2009 ignited massive protests against the government and fraud allegations.” President Obama not only did not support the protesters, he said it was unseemly for the U.S. to “meddle” in the internal affairs of Iran. Be glad you’re not an Iranian. If our current political and media pose a threat to our ability to learn the truth about Benghazigate and other outrages, at least they are not engaging in the kind of repression occurring in Iran. Yet. Tags: media bias, liberal media, Benghazi, Benghazi hearings, House Oversight Committee, op-ed, Alan Caruba To share or post to your site, click on "Post Link". Please mention / link to the ARRA News Service. Thanks! Look at the numbers It tells a very interesting story of Hiding information from the people. At least Fox looks into the situation that other News groups ignore.